Food aggression is a form of resource guarding in which a dog becomes very defensive when eating and uses threats to force others away. It can be directed towards other animals, humans, or both. The behavior can also extend to treats. Mild: the dog growls and may show its teeth. Moderate: the dog snaps or lunges when approached. When a dog is eating, his body will stiffen and he may keep his head down. He is using his body language to “hover” over the meal and protect it. The whites of your dog’s eyes may be visible, their ears are held back, their tail is lowered, or their hackles may rise. A dog may show any or all of these signs. To begin retraining your dog to let her guard down around the food bowl, some behavioral changes need to be made. Before you even begin to prepare your dog’s food, make her sit or lie down and stay, preferably just outside of the room you feed her in. Train her to stay even after you’ve set the bowl down and, once the bowl is down, stand close to it as you release her from the stay and she begins eating. Move away after she’s began eating. She may give you a few hard glances but stand your ground. In wild packs, the alpha dogs eat first, before everyone else, and it should be no different in a human/dog pack. Never feed your dog before or while you are eating. You eat first, then your dog. 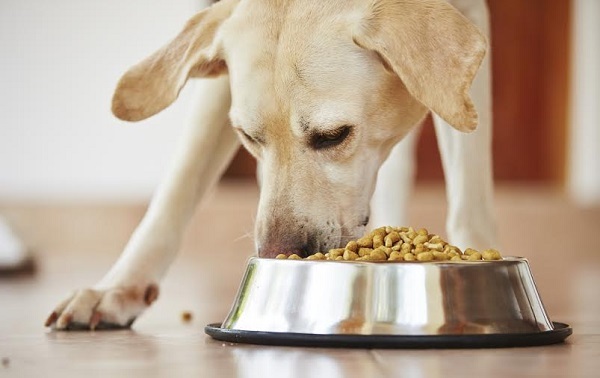 If the source of your dog’s aggression is fear or anxiety over when the next meal is coming, then be sure that you are feeding your dog at the same times every single day. Dogs have a very good internal clock, and with consistency, they quickly learn how to tell when it’s time to get up, time to go for a walk, or time for the people to come home. Mealtime should be no different. Be regular in feeding to take away the anxiety. Food aggression can actually be made worse if you back away from the bowl, because that’s what your dog wants. Start your dog’s meal by giving him food by hand, and use your hands to put the food in the bowl, which will give it your scent. The goal is to get your dog used to eating while your hands are near and to have no aggressive reaction if you stick your hands in or near the bowl while he’s eating. Drop your dog’s favorite treats into the bowl while she’s eating so she’ll learn that people approaching the bowl is a good thing and not a threat. When your dog is eating their regular food, approach them with something better, like meat or a special treat. The goal here is to get your dog to stop eating their food to take the treat from you. One is that no one is going to steal his food if he looks away from it. Two is that removing his attention from his food when people come around leads to a reward.